It goes without saying that hurricanes are one of the most destructive and deadly of forces on the planet. In 2005, Hurricane Katrina alone accounted for more than 1,500 deaths and $81 billion in damage; the repercussions of Katrina are still being felt today throughout the Gulf States and particularly in New Orleans. It is also true that hurricanes can hit with devastating force nearly anywhere in the Gulf States and Atlantic seaboard as far north as New England (many on Long Island, NY, remember the deadly hurricane of 1938). And even if you live in a state such as Florida, which has some of the strongest building standards when it comes to hurricanes of anywhere in the U.S. and the world, homes are routinely damaged and destroyed by these massive storms. Therefore, being prepared is about making sure your roof is sound -- it is the key that holds the rest of the house together (see Building a Better Roof for more information) -- and that you are properly insured before clouds even darken the horizon. In this story we will look at insurance-related issues you need to address before a storm strikes -- how do I find a good company and how can I be sure I have enough coverage, among others -- as well as what to do after the weather has cleared and it's time to put your insurance policy into action. How do I find a good company? Finding the right insurance company requires doing some research on the companies offering policies in your state. In addition, it is a good idea to gain an understanding of the different requirements and limitations imposed by government regulators in your state. There are, of course, quite a few resources to help find insurers in your area, but perhaps the best places to start are the American Insurance Association, the Insurance Information Institute and the Independent Insurance Agents Association. All three of these sites will provide useful information as well as tools to help you find a reliable insurer near you. AM Best Company and the Better Business Bureau are also great resources. AM Best will provide you with ratings and pertinent information while the Better Business Bureau provides an online tool to help search for an agent with a BBB rating. "Companies are typically rated by AM Best based on their financial strength," said Julie Pulliam, public affairs director for the American Insurance Association. "You can go onto their website and find out the financial strength of your insurance company, which is important because you don't want somebody that comes by and offers the lowest premium. You want to do your homework." There are also issues related to the state and region of the state you live in. "Coverage could be different in Florida from North Carolina or South Carolina or Alabama," said Pulliam. "In Florida, for example, some people may have insurance from company X, but company X may not offer wind and hail [e.g. 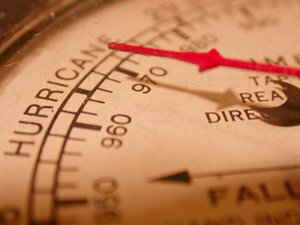 hurricane coverage] in Florida or certain parts of the state. Companies are constantly readjusting their exposure in a state or area, so some insurers have pulled back because Florida is at such high risk for hurricanes." If you live in an area where coverage may not be offered or its terms are limited, Pulliam said you should then be able to purchase a policy in your state's residual market (a state insurer of last resort). In Florida this would be Citizens Property Insurance Corporation. Will homeowner's insurance alone cover wind and water damage? The answer depends on whether your insurance company considers certain types of water damage as being primarily caused by wind or flood, said Pulliam, because damage caused by a hurricane is part wind and part flood. "Is it wind-driven water or[flooding]? It really depends on the way your policy is written and there are a lot of independent variables there," she said. "After Hurricane Katrina, there was a lot of education that had to go on because a number of homeowners assumed that their policies would cover wind driven water damage. For example, if the wind started blowing and you are starting to get storm surge due to the wind, and it comes into your house, no matter where it comes from -- ground floor, soffits, and so on -- people assumed that since it was from the wind that they would be covered, but that is not the case." What your homeowner's will cover, Pulliam added, is damage to the roof caused by wind that then enables rain water to harm the interior of the home. "It is important to talk to your agent as to exactly what coverage you would have for wind damage and all other perils, as it is called in the industry," said Pulliam. Loretta L. Worters, vice president of the Insurance Information Institute agrees that water damage can be tricky. "Homeowner's covers wind," she said. "There is some coverage for water, but that depends on the circumstances." Therefore, it is important to not only determine the type of water damage that is covered by your policy, but whether or not you have flood insurance as well. This type of insurance is generally provided by the federal government's National Flood Insurance Programs (go to FloodSmart.gov for more info), which is administered by many insurance companies offering homeowner's coverage. "Flood policies are fairly plain vanilla," said Pulliam. "They cover the water issues for the most part." Worters adds that it is also very important to make sure that you have the right amount of coverage. "You need enough insurance to rebuild your home and to replace all of your personal belongings," she said. "If you have made a major alteration or improvement to your home or have made significant purchases, notify your insurance agent so that the increased value is reflected in your policy." What documentation do I need now to be prepared for the worse? Both Pulliam and Worters said it is important to create some accounting of the value of your home and the possessions in it. This could be as simple as a list written on a legal pad with some photos, but probably should be more detailed and kept in a remote and/or safe place. "A home inventory will help ensure that you have purchased enough insurance to replace your personal possessions," said Worters. "It can also speed the claims process and substantiate losses for income tax purposes. 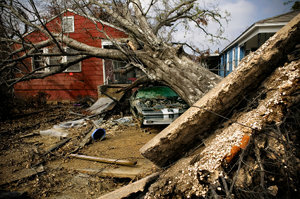 A detailed home inventory is also helpful should you need to apply for disaster aid." The Insurance Information Institute provides free Web-based software at KnowYourStuff.org, which allows users to create organized lists of possessions, include digital photos, and save scanned receipts. It is also important to understand your policy's deductable (e.g. the amount you will pay before your insurance kicks in). Generally, said Worters, most people living in coastal areas, especially those prone to large storms, will have percentage deductibles for storm damage rather than traditional deductibles of a set amount. Pulliam adds that these vary and can range from one to two and even ten percent of the cost of the damages. "It really depends on how much risk you want to take on," she said. "If the consumer is going to take on a higher deductible it will allow the company to write more policies because they know the policyholder is going to pay more themselves." Both Pulliam and Worters said that selecting the right deductable should be based on a balance of your home, belongings, and income. No matter how well prepared you may be for the storm -- the strongest roof and best insurance coverage available -- there is little you can do if a storm tracks over your community and hits close to home. The following should help you understand how to react so that you are covered and can quickly find temporary shelter, if you need it, and protect your home from further damage. What do I do after the Storm? According to Worters, it is important to call your insurance company as soon as possible after the storm as many companies place a time limit on filing claims and state laws on deadlines differ by state. Once you have called, adds Pulliam, the process insurers go by can vary, but the company will likely send an adjuster out immediately to document the damage and file the necessary paperwork. If there has been widespread damage, it may take a few more days, which means you should try and take your own photos of the damage to show the adjuster when s/he arrives. Worters and Pulliam add that the insurer will pay for alternative housing at a hotel or motel and will even issue a check a debit card on the spot in order to get money in your hands so you can purchase accommodations, food, and take care of other immediate expenses. "If your home is severely damaged and you need to find other accommodations while repairs are made," said Worters, "keep records of all additional expenses incurred. Homeowner's insurance policies provide coverage for the loss of use of your home if it is damaged by an insured disaster." Worters and Pulliam also said you should attempt to make temporary repairs to your roof if it is safe to do so. "If it is something you can do safely and it will prevent further damage, then by all means do that," said Pulliam. "For example, if you can safely get up on your roof and put a tarp up to protect your property; then yes do it." As with any thing you do prior to the arrival of an adjustor, save any receipts for items you have purchased. 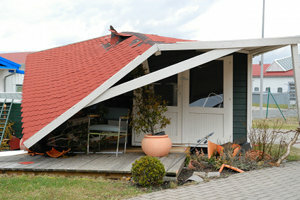 Can I be sued if my roof comes apart and damages someone else's property? The answer to this question may vary on certain circumstances, but the best means to prevent and protect yourself is to ensure that all roof maintenance is up to date. "In today's litigious society, anything is possible," said Worters. "It is more likely that if roof tiles fly off and hit someone, you might be sued for negligence if your roof needed repair. That's why it is important to maintain your home and to carry liability insurance to protect you and your neighbor's property." In all, ensuring that your insurance will cover you if a storm should damage your home requires due diligence on your part. However, there is nothing like a good night's rest knowing that if the worst should happen, you and your family will be financially protected.